At the Mobile World Congress exhibition this week HP have taken the wraps off a new addition to their range in the form of the new HP Slate 7 Android tablet. The HP Slate 7 is equipped with a 7 inch HFFS display sporting a resolution of 1024 x 600 and is powered by a 1.6GHz dual-core ARM Cortex-A9 processor, supported by 1GB of RAM. The HP Slate 7 is fitted with 8GB of internal memory which can be expanded using the included microSD card slot when required. Other features of the HP Slate 7 include a 3 megapixel rear camera and VGA front facing camera, together with microUSB port. 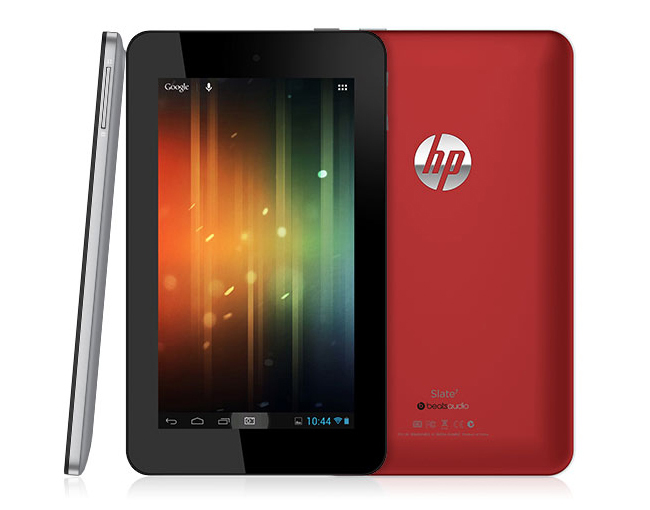 The HP Slate 7 comes supplied running Google’s latest Android 4.1 Jelly Bean operating system, and will be available in either read or grey, and comes with Beats Audio, and also access to Google services such as Google Now, Gmail, YouTube, Google Drive, and Google+ Hangouts to name just a few. The latest HP Slate 7 Android tablet will start shipping in April for $169 and measures 0.7mm x 197mm x 116mm in size, and weighs in at just 13 ounces.